Psalm 119:18 - Open thou mine eyes, that I may behold wondrous things out of thy law. The earth and the world here can not mean the same thing from a scriptural perspective. 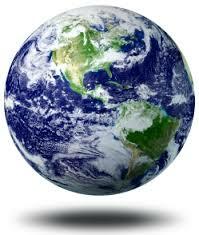 The Psalmist says the EARTH IS THE LORD'S AND THE FULNESS THEREOF; THE WORLD, AND THEY THAT DWELL THEREIN. So you see, while the EARTH is a physical structure that can be touched and seen, the world is actually not a physical structure per se but refers to the sectors of operation and administration upon the earth such as: the political world, the entertainment world, the commerce world, the science and technology world, the medical world, and so on. Satan is the god of the world not the earth! That is why in the great commission of our Lord Jesus we are sent to the world not the earth! We are to dispel the darkness satan has introduced into the world with the light of God. This is an individual responsibility to be fulfilled wherever we have been sent to! 2 Chronicles 7:14 - If my people which are called by name (the Church) shall humble themselves and pray, seek my face, and turn from their wicked ways; then I will hear from heaven, and will forgive their sins and will heal their land. God want's to heal the land of the new plagues and diseases that keep surfacing every now and then as well as heal the land of the natural disasters that are claiming the lives of young and old alike. God wants to heal the land of every form of evil in our midst. But we as the church need to...PRAY, and now at that! You say what if we don't pray? What would happen? After all God is a merciful God! Let me tell you what would happen! You see God at one time sent a prophet by the name Jonah to a great city called Nineveh; they were practically drooling in sin and iniquity (as we can see even today). However when Jonah gave them the warning of the LORD they repented with fastings (everyone of them right from the King to the least person, even animals were made to fast!) and judgment was averted. However some years down the line we see in the book of Nahum that Nineveh still ended up being destroyed! Question: So what was the point all along of Jonah bringing the word of the LORD to them you may ask? It's simple, the generation that hearkens to word of the LORD is the generation that will be spared!